Last weekend was the first weekend in a long time where I was not outdoors chasing fish. This is the "in-between" time of the year, where the ice is not great, and the lakes are not open for fishing either. Normally this time of year drives me crazy, but this year, I have not felt that mental strain yet. This past weekend, my wife, and two kids spent time back in Independence at my folks house, and it was a great way to unwind after a week of work. Luckily for us, my older sister, younger sister and my brother Tim and his family were in town too, it was a small family reunion. It was fun to say to least, playing cards with my parents, that didn't turn out very well for me...and watching my kids play with their cousins, aunts and uncles is always fun too. Ranger and I even made it out sledding at my parents house, I think that was the last time, but it sure was FUN! they sure do CATCH BASS! Lately, I have been spending a lot time with Hot Rod Baits, getting things lined up for the busy fishing tackle season which is just around the corner. There will be some new colors coming out this year and a whole new line of baits, called the Big Daddies. I can't wait to get these into customers hands and see them catch bass this year with them. As the forecasters are predicting temperatures in 50's all next week, I am hoping to get some time on the water soon. However, for now, life is good! I have been saying all week that this past Sunday was my last day on the ice for this ice season. No matter what became of the day, good...bad, or ugly, I was calling it quits for the year. Well, the day came and went quickly, as most fishing trips do for me. However, it won't be forgotten that fast. This big 'gill hit in about 18 feet of water on top of a brushpile. I made arrangements to fish with Don Henry and Mark Anderson. Don has visited Hickory Grove with me many times, but this was Mark's trip to the lake for the first time. 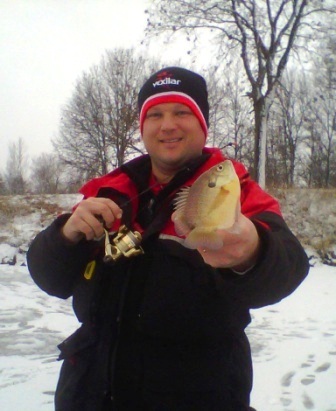 Mark is no rookie ice angler though, he can fish with the best of them. In short, we hit seven different brushpiles by 11:00am, not bad for 4 hours on the ice. We would have made half that progress without our modern ice fishing tools though. The GPS took us right to my brushpiles, the gas augers made quick work and we were dropping the Vexilars down twenty to thirty holes in no time. Almost all the piles gave up some fish, bluegills were abundant this day, as most days are at Hickory Grove. I really don't know how many fish we caught, but between the three of us we probably had our hands on at least 60 bluegills in the first four hours. That is an estimate of course, but I would bet it is very close to the actual number. To say the least it was a fun morning, and I think Mr. Anderson will be back to this lake. an 11-incher on the last day. Mark had to head back home to Des Moines, but Don and I hit one more pile on our way back to the ramp...same story, the bluegills were cooperative. After that slowed I said, let's try the other side of the lake for a while. Don was more than ready, as usual. We drove around the lake (the middle portion had about 20 acres of open water) and fished the west side. The first two brushpiles...which are "guaranteed spots" came up with no fish on Vexilars. Hmmm, well with this being my "last trip", I couldn't go out like this, being defeated at my last "guaranteed spot". NOPE, that is not me, so we hiked over to my favorite spot on the lake, one that isn't know for a lot of fish, but the ones that are there, are normally bigger than average. BINGO, gill, after gill, after gill, and then a nice crappie to "ice" the day. Now this was the way to end the year. My last spot was a success and was a nice way to cap an interesting ice season. The ice at Hickory Grove Lake is still pretty good, if you know where to trek, a lot of the lake would not be considered safe for ice fishing though (let me know if you need pointed in the right direction). We had our safety gear, took the proper precautions and I had the knowledge of the ice conditions from being there last weekend too. One last time...welllllll, YES, that was it, the Vexilars are put away, and the rods have been laid to rest until later this year...hopefully Thanksgiving weekend! It is a sad week here in Central Iowa, as the ice is disappearing quickly. It has been melting for quite some time actually, but the ice fishing season is coming to a close for us. It is without a doubt, that I have not seen a winter like this for at least 10 years. The past two winter seasons have provided safe ice all the way into March. As I look at the extended forecast, I can only assume that I will be in my boat on area lakes the first part of March. It has been a good ice fishing season for me and my friends, as we made it out every weekend after January 1st. The water froze late this year, and never reached ten inches on area lakes. Normally this time of year we would be drilling through 15 or more inches of ice. I am just hoping to see four or five inches of ice this weekend to give it one more try. Late season ice is never the best ice; first ice is always the best, as it is new and solid. A lot of anglers in the area have only fished a few times this winter and have put all their ice fishing gear away. I don’t blame them one bit. I have been frustrated with the ice conditions all year long. I guess Mother Nature really put it to us this year, but the last two winters have been long for ice fishing. Either way, if you are still looking for ice this weekend in the area, you must use extreme caution. Caution is always taken early in the ice season, but as the season goes on, many people tend to forget those safety precautions. My group of friends have not gone on the ice one time this year without all of our safety gear. I can’t remember any winter like that, but it’s always better to be safe than sorry. Once again this weekend, all the safety gear will be with us, and at the ready if needed. Hickory Grove has had good ice the longest of any area lake, and in parts of the lake the ice is still pretty good. However, as with Hickory Grove, and any body of water/ice this time of year, the depths of ice can very A LOT. You must use a lot of caution as the ice has been shrinking and is becoming unsafe in many ponds and lakes in the area. It is always very tempting to “try one more time” at the end of ice season, however, I’ve grown past that. I always plan one last trip, and then put everything away, this weekend is that time. Am I guaranteed good ice…no, will I take every precaution for safety, yes. I look forward to one last time on the ice this year with friends, but it is always bittersweet. On one hand the ice season is gone…well at least for another nine months, but on the other hand the area lakes will be opening up and ready for shore angling or getting the boat out soon. I guess looking back on the ice fishing season I made it to a lot of different bodies of water, which is always fun. 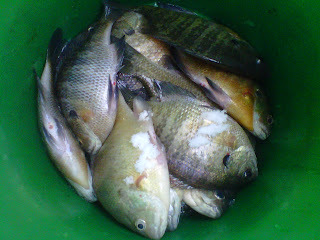 I was able to fish a new farm pond and caught some really nice crappies and bluegills out of. I had several great days on Hickory Grove catching bluegills, and made a trip up north to Clear Lake to catch dozens of yellow bass too. I also had a blast catching largemouth bass this winter, by far the best winter I have ever had for catching bass. It sure is fun to catch a two-pound bass on pole that is sixteen inches long! 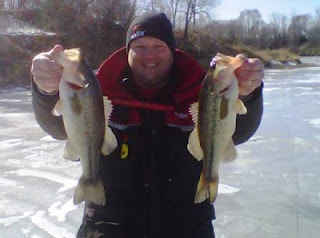 Each winter I always look forward to competing in ice fishing tournaments too, but this year both events that I was going to fish have gotten canceled due to the bad ice conditions. I guess I will be more eager to fish in them again next year. Ice fishing isn’t all about finding and catching fish, it has deeper roots for me too. Going out on the ice with friends and family to see if you can trick some fish into biting has been my Outdoor Ambition for over two decades now. This year I was able to ice fish with many friends; Brian, David, Peter, Don, Chad, Mark and my son Ranger also. In all my adventures on the ice this year, most days were fantastic with the way the fish cooperated, and there were a couple days where getting bites were tough or even rare, however having friends to joke and talk with always made the time fly by quickly. I was once told by an old friend of mine that the hours a person spends fishing doesn’t count toward their lifespan, I sure hope that is true! As spring is around the corner, I guess I have to say good-bye to the ice, although it is about a month too early. Maybe, just maybe it will warm up quickly and I can get the boat out very soon. Ok, fine, I admit it, I’m addicted to fishing! My companions for the day, David Bowles, Brian Bowles, and Chad Pietig all had hopes of finding some good, "safe" ice in the Marshalltown area. Well, as I often say there really is no "safe" ice, and today was definitely a day that required a lot of attention to safety. We started our travels south to Rock Creek. We checked the east side of the lake, and saw nothing that we could even take one step on without breaking through. Then we set out for the west side of the lake, same thing. Rotten ice that couldn't support a small mammal, let alone 4 grown boys! After a bit of disbelief, some unkind words towards Mother Nature, and we were off to try lake #2 for the day. Did I mention that it was a blizzard at Rock Creek? Huge snowflakes, as wet as a drop of rain were falling and covering our tracks as fast as we made them. Again, more negatives were said about Mother Nature! As we started our way north, back up to highway 30 to head west to Hickroy Grove, I pulled Weather.com up on my trusty BlackBerry. It showed the whole southern half of the state covered in a snow storm. Well, there goes any ice fishing to the south for the rest of the year. We could always go to northern Iowa to ice fish, but in the beginning of February...are you kidding me??? With every mile we drove north, the snow seemed to disappear, it was quite a site really. By the time we got to highway 30, things were all but dry. We headed to Hickory Grove with high hopes, we were just there six days prior and had a great day catching bluegills. The ice that day was about seven to eight inches in depth. The ice couldn't have melted that fast...could it? The Grove, as we call it did not disappoint, the ice was good in the location we picked, and not a sole was to be found on the lake. We were the only ones brave enough, or stupid enough, depending how you look at this story to hit the ice this day. We set up on a brushpile and immediately started catching fish. All those harsh words towards Mother Nature just melted away after seeing fish after fish show up on the Vexilar screens. 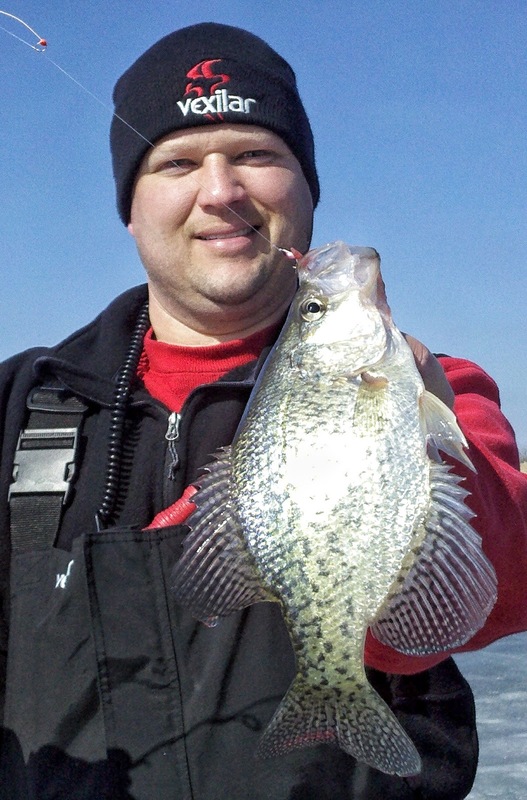 We ended up hitting three brushpiles this day, two of them really paid off with nice bluegills, and even one of those elusive Hickory Grove Crappies made an appearance. A great day, and a safe day was had on the 5 inches of "solid" ice that we found. Keep in mind we had all of our safety gear with us, a plan for an emergency and we were all carrying our common sense cards this afternoon too. There are not many days on the ice left, unless Mother Natures blesses us with some real winter weather, and I mean some single-digit, frigid cold. Come on Mother Nature, you can do it, please!!! If you are venturing out looking for some ice, please remember to take other people with you, safety ropes, flotation devices and the willingness to say the ice is not safe. Everyone needs to take EXTREME caution when ice fishing for the rest of the winter season. meal for the Bowles' family.